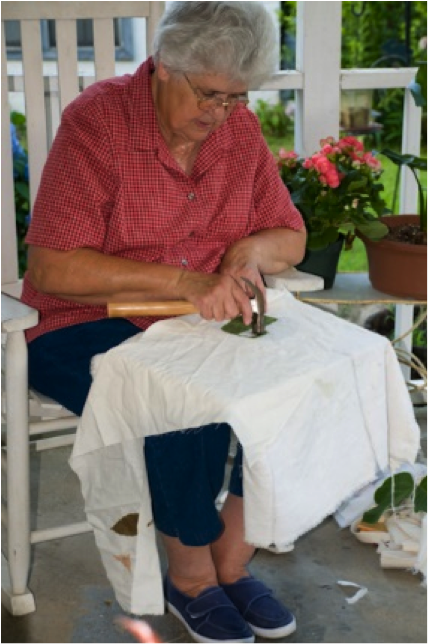 Sylvia G. Stephens, under the auspices of the Alabama Folklife Association in 2014, compiled a detailed, illustrated guide to Cherokee Leaf Pounding as done by Bettye Kimbrell. This page presents those instructions in a web friendly format. You may download the original, printer friendly, document at the link below. Choose a hammer with a smooth, flat steel face — not a rubber mallet. 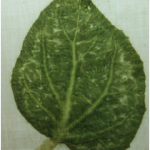 The hardness of the steel head is needed to smash the chlorophyll out of the leaf so that it stains the fabric. 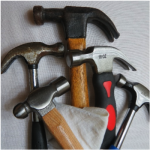 Select a hammer that is the right size and weight for your hand to allow for continuous pounding. The correct weight helps avoid injury to your wrist, arm and shoulder. 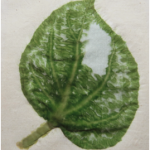 Keep a small scrap of cloth handy to wipe off tiny plant particles or stain that may accumulate on the head. 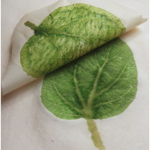 Keep leaves “fresh” with a moist paper towel inside a plastic resealable or brown paper bag. 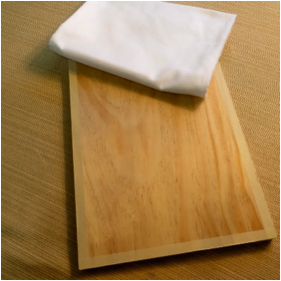 Unbleached, off-white, 100 % cotton muslin fabric is recommended. 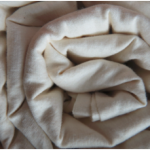 Select a quality, weight and thickness of muslin suitable for your project. 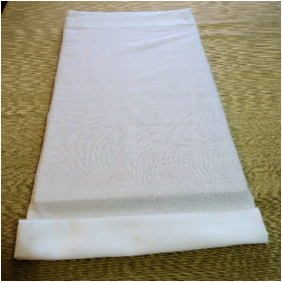 Muslin can be 36-108 inches wide. 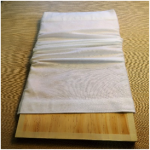 Choose an off-white muslin texture that you can see through when pounding. 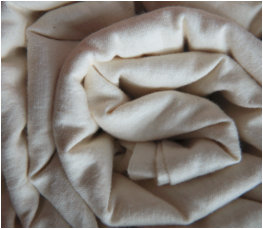 The muslin may be washed or unwashed. 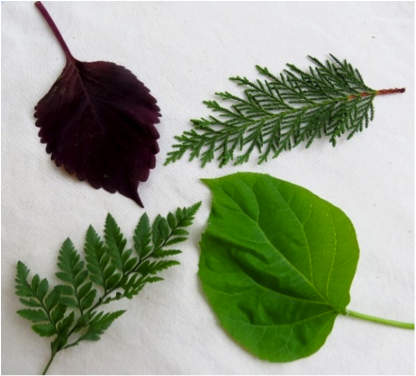 Select leaves for your project. 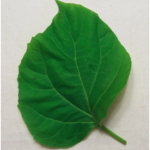 Choose only the leaves you intend to pound that day. 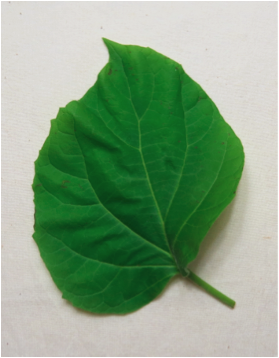 Keeping leaves overnight or for several days causes the leaves to dry out and color intensity to decrease. 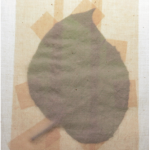 the cloth, depending which way it lies flatter. leaf flat on the muslin. 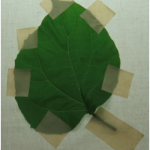 Tape down and cover the entire leaf onto the fabric with the masking tape. 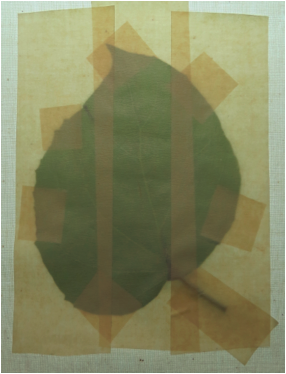 Overlap edges of the masking tape to cover and enclose the leaf under the tape. 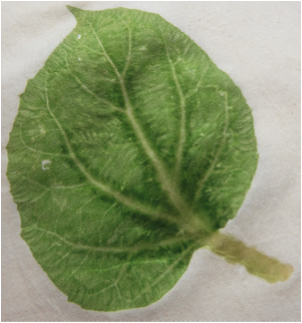 Be careful to keep the leaf, stem and all outer edges flat when taping. 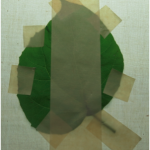 After the leaf is taped to the cloth, flip it over so the FABRIC SIDE IS UP and the taped side is down. 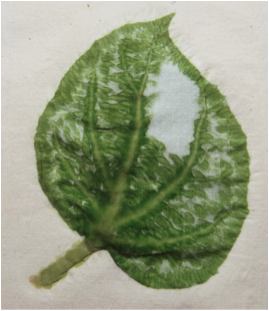 You should be able to see the size and shape of the leaf through the fabric. 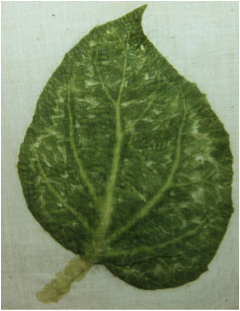 Smooth over the taped leaf to be sure it is flat before you start pounding. Sit in a chair with your feet flat on the floor so that your lap is level. Position the cloth-covered pounding board across your lap. 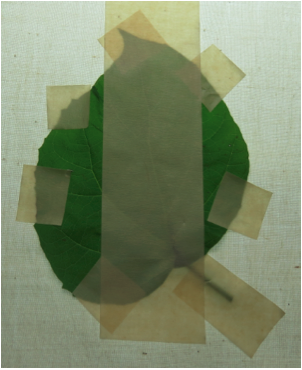 Spread the taped leaf — fabric side up — over the board. Notice how the hammer is grasped by the hand under hammer claw and around the cheek for pounding. 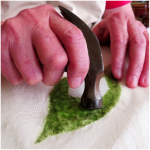 Pounding must be firm–yet gentle–to release the leaf stain and so the fabric is not damaged. With fabric side up, use the hammer to lightly pound around the outer edge of the leaf through the muslin fabric. 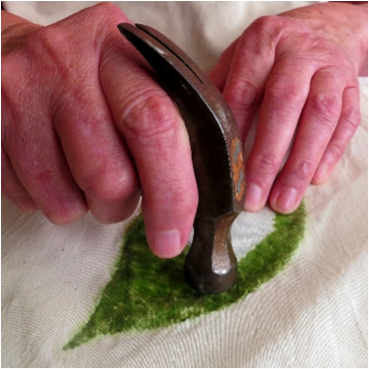 Tilt the hammer at a slight angle as you beat through the fabric so that the bell edge of the hammer head crushes the leaf and releases the chlorophyll stain to be absorbed into the fabric. 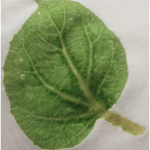 Then pound over the center area of the leaf area to continue to release the chlorophyll stain. 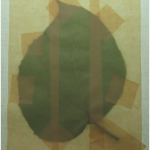 When you are satisfied with the shape and color of the stained leaf, flip the cloth to the underside to peel away the masking tape. 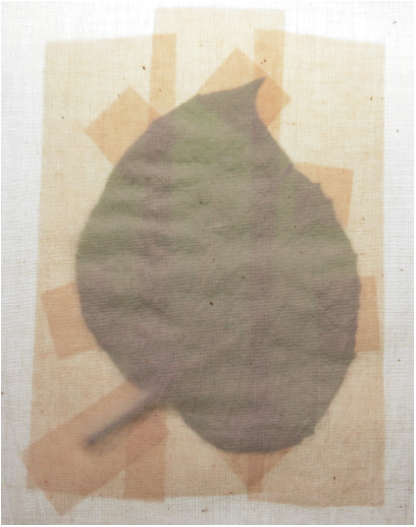 After the leaf pounding — and staining — is complete, flip the cloth back over to remove the masking tape. 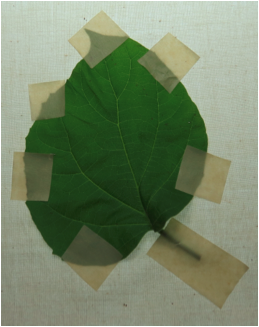 Starting at the outer edges of the masking tape, gently lift and peel the taped leaf away from the cloth to reveal an interesting leaf image with designs as beautiful and intricate as the original leaf. 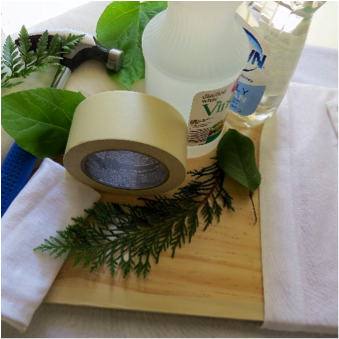 Mix one pint of vinegar in one gallon of water. 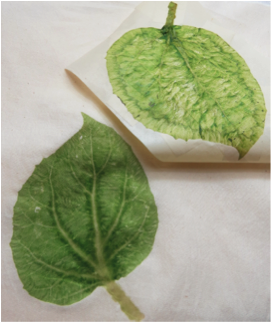 Loosely soak the fabric in the vinegar-water solution for approximately 15 minutes to an hour to “set” the chlorophyll stained design into the fabric. 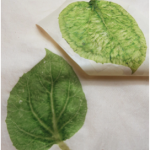 Once the design is set, wash and gently scrub the cloth using a white or clear detergent or dishwashing liquid to remove any plant particles or leaf residue. Rinse the fabric until the water is clear. Gently wring — and dry the cloth in a machine dryer or hang to dry. 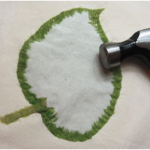 Make your quilt using traditional or contemporary quilting techniques. Use a “whole cloth” as Bettye Kimbrell describes in the book about her life, Out of Whole Cloth: The Life of Bettye Kimbrell. Use the patchwork approach and piece together blocks of fabric to create a quilt top that can be used in a quilt sandwich. 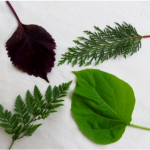 Pound various sizes and types of leaves into the cloth to make table napkins, table runners or clothes. 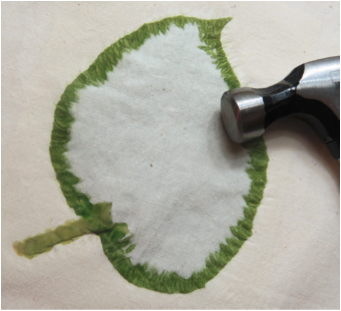 Embellish the leaf with assorted beads and fabric colors to create unlimited designs.